On Native American reservations across the Southwest, Christmas can be a time of particular stress. All year long, residents cope with scarce jobs, low incomes, and severely limited opportunities for shopping — but during the holidays, these obstacles also make it difficult if not impossible to shop for special food or gifts. Thanks to a helping hand from SWRA, many children and Elders receive a present to mark the fact that it’s Christmas and some simply enjoy a hot meal. In the weeks before Christmas, SWRA delivers literally thousands of gifts and stockings to Program Partners on reservations throughout the Southwest. Some Program Partners and their volunteers make a community affair of stuffing stockings and wrapping presents for children and Elders in need. Christmas cheer is spread as the presents are distributed. 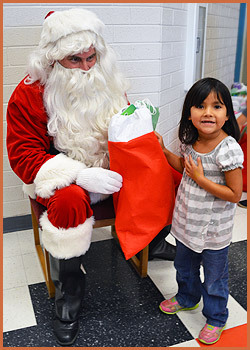 Thousands of children from head start to high school receive toys and other gift items at their schools, boys and girls clubs, or early education programs in their tribal communities. A few communities have “Santa Stops” where our staff dress up like Santa to give out the stockings and toys. Elders receive gift bags of socks, a blanket, batteries, personal care products and other practical items. Some communities gather their Elders, families and children for a community-wide Christmas meal, sponsored by SWRA and our Program Partners.